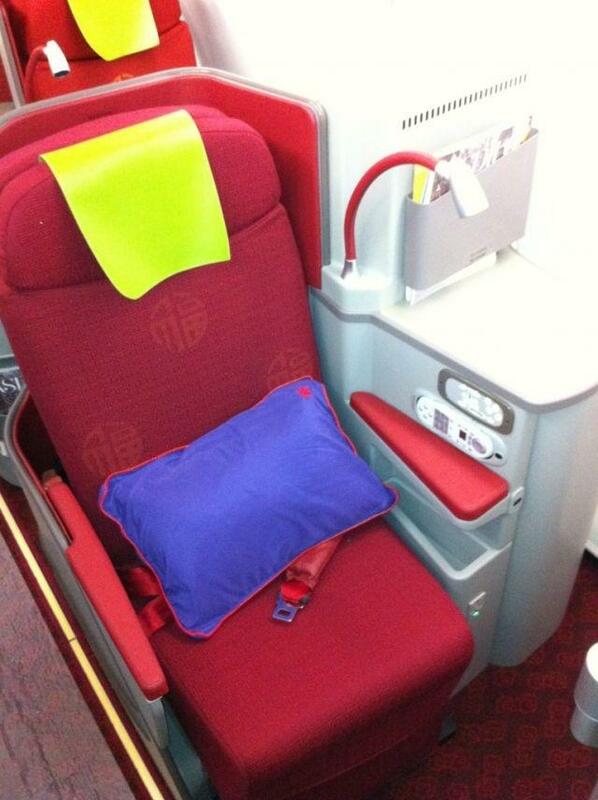 Hong Kong Airlines has been giving journalists and VIPs a look inside its groundbreaking all-business-class Airbus A330-200. The new plane, which will take off between Hong Kong and London on March 7, has been decked out with a business class and first class cabin, promising the highest standards of luxury for passengers on the three-times weekly service. In Club Premier, passengers will be offered lie-flat seats with an overall length of 6"1', while in Club Classic travelers will be able to stretch their legs into a seat-to-seat distance of 51" (129 cm), in seats 22" (55 cm) wide. The entire cabin will be WiFi-connected courtesy of OnAir, so that passengers can access email and the internet on mobile phones, tablets and laptops, Hong Kong Airlines revealed late last year. In-flight dining will be provided in conjunction with celebrity Chinese chef Chow Chung and British chef Jason Atherton, formerly of London's Michelin-starred Maze restaurant. A typical menu obtained by Relaxnews shows dishes including Scallop Stuffed Prawn Mousse with Sesame Honey Sauce, Chicken Wolfberry and Ginseng in Noodle, Smoked Citrus Salmon with Fennel Radish Salad and Beef Fillet with red Wine Sauce and Roasted New Potato Wedge. The airline's signature cocktail will be the Bauhinia Blossom, a non-alcoholic concoction recalling Bauhinia, Hong Kong’s city flower, and pomegranate -- although for something stronger, passengers will be able to stop by the fully stocked Sky Bar. The first flights will take off just a week before Hong Kong Airlines' rival Cathay Pacific launches its new "premium economy" service on the same route.